Author’s Note: Every year I look forward to releasing this post in mid-to-late February as Oscar season is heating up. Just as I was about to prepare this year’s post, my time was swept away by The Great Apartment Flood of 2018, in which my upstairs neighbor left for the evening, not realizing they had overloaded their washer. For several hours, water poured across their floor and seeped through my ceiling, creating a scene like the original Jumanji as it rained in my bathroom and kitchen. 10 days in a hotel and 2 writing conferences later, I returned to my apartment and normal life. However, with my already busy schedule combined with (1) tasks I had to push back due to the flooding and (2) additional tasks and paperwork to manage after the flooding, it’s taken me almost four months to get back to this post. (In those four months, I also finished Book 3 of The Pippington Tales (The Matchgirl and the Magician, which I sent to beta readers yesterday – I am super pumped). While this is four months later than planned, I think it will still be fun as the summer movie season is heating up. So, thank you for your patience, and, without further ado, let’s get back to the 2017 W.I.T. Awards. Welcome to the 2017 Watched-In-Theater Awards, honoring the movies I have actually seen in the theater. You are welcome to share your own personal WIT awards in the comments below. In late January 2018, I was trying to remember all of the movies I had seen in 2017. I knew there was a third Marvel film on the list, but I couldn’t remember what. When I looked up movies that came out in 2018, I was surprised I forgot Guardians of the Galaxy 2. If you’ve followed my blog a while, you know I’m a much bigger Star Wars nerd than Marvel or DC. This film is a frothy, good time with some serious moments that drag it down. Yondu, Rocket, and Groot’s story is the best part of the film. It’s a fun addition to the Marvel franchise, and the opening sequence of Groot dancing while the rest of the group battles, is awesome. However, and obviously, it’s not the most memorable of films. It’s kind of like having a bite of cotton candy, enjoying it for the moment, and then forgetting about it a few hours later. While Guardians of the Galaxy is a single batch of cotton-candy, The LEGO Batman movie is like an entire cart of cotton-candy laced with Poprocks exploding in your face. This is arguably one of the best Batman movies of all time, embracing the silliness of Adam West’s Batman with the spasticness of The LEGO movie. I had a great time watching it, and, if I had a 5-12 year-old kid in my home, I probably would have it memorized. However, as an adult, it’s just a movie I watched, enjoyed, and forgot about. This is a good film mixing the light-social commentary of The Help with the science history lesson of October Sky. All-in-all, this is a film which will be replayed 10,000 times in high schools across America where a teacher needs quick lesson plans for their subs. Great performances, good movie, and fantastic soundtrack. Not the greatest of films, but solid enough and with an important enough message to see at least once. I saw this film with my youngest sister, who is a major Marvel fan. Any Marvel movie is elevated by watching it with her and seeing her excitement. Michael Keaton (speaking of Batman…) and Tom Holland are fantastic when it’s just them acting and being their characters. The movie falls apart when we get into paint-by-numbers CG action at the end. A good intro to Spiderman in the Marvel universe, and a pretty good mash-up of the high school and superhero genres. First, this trailer is one of the best I’ve seen in a long time, and Cate Blanchett looks awesome as Hela. This film’s director, Taika Waititi, has a quirky sense of storytelling that adds a lot to this film. I was excited about this film ever since I saw Waititi’s film “Hunt for the Wilderpeople”, which, if you haven’t seen it, you should. The off-kilter storytelling, breaking of tropes, and allowing Thor to have a sense of humor, all mix well into the galactic Marvel universe. It’s not a perfect movie – Cate Blanchett could have been better used as Hela, and it’s as frothy as Guardians of the Galaxy 2 and The LEGO Batman movie, but it’s fun. I don’t know if I’d watch it again, but I had a good time. The Live Action Beauty and the Beast starring Hermione Granger and CGI voiced by A-List actors is a better film than it should be. I give much of the credit for pulling this off to the director, Bill Condon, who directed Dream Girls and wrote the screenplay for Chicago. He also worked to salvage the last few Twilight films in the franchise. Emma Watson is great as Belle and Dan Stevens is able to have a strong presence even while drowning in high-end CGI. There are enough twists on the original story to merit another version, and Kevin Kline brings a softness and warmth to Maurice that is missing from the original. The highlight of the film, of course, is Luke Evans as Gaston. He has the presence, the manliness, and gusto to pull off the villainous hunter. Is this greatest film? No, but it’s a solid fairy tale with enough magic to motivate me to watch it again. I posted a full review last year when I saw the film. Both Wonder Woman and the next film on the list, Star Wars: The Last Jedi, are complicated films to discuss. Parts of both are excellent while other parts fall a bit flat. Overall, Wonder Woman is a great film bringing us an excellent Super Heroine. Gal Gadot as Diana Prince brings us a woman with great integrity, who is focused almost to a fault on doing the right thing. The film is a tightly wound piece of cinematic storytelling, especially when Diana steps out into No Man’s Land (as Eilonwy says when she stabs the Nazgul King, “I am no man”), and keeps on strong until it begins to unravel once Ares is revealed and the CGI video game battle begins. So, in short, a great superhero movie that doesn’t quite stick the landing. Here is my more in-depth review of the film. Star Wars: The Last Jedi is a complicated film to love. There is so much greatness: Poe’s character arc, Rey and Kylo Ren’s strange relationship built through Force-to-Face communication, the cruiser hyperspacing into the middle of a dreadnaught, Rey and Kylo taking on Snoke and his guards, Luke’s epic showdown with Kylo Ren. And then, there are the parts that are harder to love: Finn and Rose’s long journey which ends up not doing much in the end, Grumpy Old Luke, weird Yoda cameo, and Mary-Poppins-Leia. I like the movie overall, but I didn’t enjoy it as much as I did The Force Awakens. While La La Land technically came out in late 2016, I didn’t actually watch the movie in theaters until Spring 2017. The movie is excellently made as a love song to Los Angeles and the media industry. As (1) a film nerd and (2) a musical fan, I am the audience this film was made for. The film is beautifully crafted, the story tight, the characters strong. The singing isn’t the best, but the emotion is there. It blends nostalgia with the modern in a wonderful way. Many didn’t like the twist on the Hollywood ending, expecting a classic close to a classic love story. I loved it. I felt it was true to the characters and the sacrifices they made along the way, and was an ode to how we often look back on life and think of what could have been if we were better people. It’s a great film, but it’s not a film for everyone. La La Land also gets bonus sentimental points because I watched it two weeks before I moved from the Los Angeles area to San Antonio, TX, and it was a fitting swan song to a complicated but beloved city. 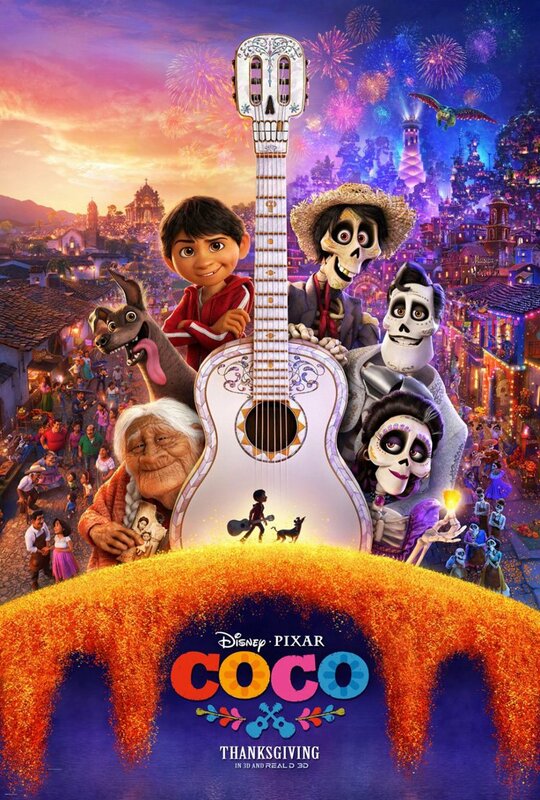 Coco is the first Pixar film since Toy Story 3 in 2010 that I would categorize as great. The film has a gorgeous, unique world full of vibrant life and energy. The story is taut and well-built, with Miguel a protagonist we cheer for from his initial goal of being a musician to his later goal of saving an ancestor. His ancestors have more depth than silly one-off cartoons, and the music is fun (I may have listened to the soundtrack a lot for the past few months). And bonus points for an awesome dog in Dante. What I wrote above already makes Coco a strong film. What elevates Coco to the echelon of great Pixar films is the heart of the story. We can measure the quality of most Pixar films by the number of tissues we use throughout the story. When I watched Coco the first time, I went alone and was grateful for my long sleeve shirt, since I had no napkins or tissues. I had a very wet sleeve by the end of the movie. I brought extra tissues when I went to see it a second time while visiting my family in California. Which is especially good, because watching the film’s opening after knowing the full story, I found myself teary-eyed in the first 3 minutes. Hector singing “Remember Me” to Coco is heartbreaking enough. But, when Miguel sings “Remember Me” as he is trying to save Hector from disappearing, I just gave up on holding things in. And, since buying it, I think I’ve watched it a couple times. It’s a sweet story and a great movie. What was your favorite movie from last year? What would you pick from the movies I saw? A review of Solo: A Star Wars story… short version, the film is fun and does a great job of stripping Star Wars to its core of adventure, blaster fights, and space battles. Updates and announcements regarding The Matchgirl and the Magician (The Pippington Tales Book 3)’s launch date. Aw. I think LEGO Batman got the short end of the stick. Were there any movies in 2017 that you hated? Though, I think I saw it early in the year, a month or so before I moved from California to Texas – which is also about when I saw Guardians of the Galaxy Vol. 2, so that might also be contributing my cinema-amnesia. I once had a bathroom ceiling badly messed up by an overflowing bathtub.The room looked as if someone had sprayed dirty water all over it. No fun. Sorry to hear you had an even more drastic problem. Third Book (The Matchgirl and the Magician) is deep in progress and nearing the final stages before publication. It should be ready sometime in mid-to-late Fall. Oh man… I think we need a longer post about the water jumanji apartment fiasco. I actually really liked Guardians 2 and didn’t like the Beauty and the Beast retelling at all. I found it boring but thought Guardians had a lot more heart than other marvel movies and a lot too think about. It’s always interesting to see! Honestly I would probably pick Hidden Figures and Wonder Woman at my top. I couldn’t make it through La La Land but I was jet lagged and tired when I watched it so I should give it another chance. I’ve only heard good things about it. Looking forward to the Solo review! La La Land is great if you’re a film nerd, especially if you love classical Hollywood musicals. I loved it, but it’s not a movie for everyone.